Chatting with interesting people. The image below is my own! Claude was born in Montreal, Canada, where he still resides with his spouse, Joanne. His first stab at writing was in 1995, the result being his first novel, Vigilante. This was subsequently followed by The Consultant(1996), Mind Games (1997) and The Homeless Killer (2009), all part of the Barry/McCall Series born fromVigilante. He has recently completed his fifth novel, ASYLUM (June 2010) which is not included in the series. When Claude isn’t writing or editing his work, he spends his time making noise with his guitars, painting in oil and watercolour, reading, traveling (budget permitting) and planning to work out. 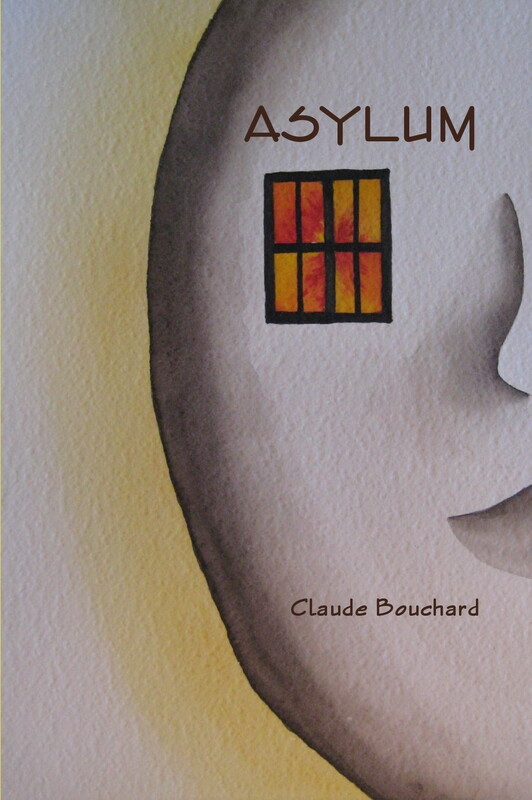 Claude is proud to be represented by Tribe Literary Agency. When or at what age did you first write something that felt like a story? I vaguely remember writing a poem which told a story when I was in grade school and may have written other stuff though nothing that is truly memorable today. My first true attempt at writing fiction was when Vigilante tumbled out of me in 1995. Was there any tradition of writing in your family? In a word, no, although my younger sister has taken to writing e-zine articles and children’s stories in recent years. The family tradition was much more so in reading rather than writing. To this day, everyone in my family is a voracious reader. When you’re in a book shop, do you like to browse, go straight to a particular section, or what goes through your mind as you pass through? The genres I read almost exclusively are suspense, mystery, espionage and legal fiction so, upon entering a book shop, I’ll generally have a look in the ‘new titles’ section for works in these categories before moving on to the general sections of works in the same categories. How would you feel if someone told you that you need never write again for the rest of your life and all your material needs would be covered? I did go for a number of years without writing after having completed my first three novels but this was a personal choice during which time painting was my creative outlet. However, I would not be keen about being forbidden to write (though the thought of having my material needs covered forevermore is a tempting one. J). If I have a story that needs to come out, I would like to have the opportunity to tell it. When or how do you get the urge to write? It all starts with a basic idea coming to mind for a story, which in my case generally involves the beginning and the end. Once that is born, I sit and write the unknown ‘middle’ of the story, basically consisting of connecting the ‘beginning’ and ‘ending’ points. When you write, do you feel drawn to a particular genre? If so, would you like to write in a completely different context? If not, what are the areas you are writing in? The genre I’ve been writing in to date is what I call crime thrillers, which is what I enjoy reading as well. To the best of my ability, I try to end my stories with an unexpected twist in order to keep my readers guessing until the end. Asylum, my fifth novel and my current work in progress is my first step away from the crime thriller genre but it will definitely end with a twist as well. Some say that you should write every day, do you find the need or desire to do that, or do you have a different approach? I do try to write every day when I have a project in the works. However, it is sometimes necessary to step back to regroup my thoughts as I determine the direction that a story is going. How do you approach your own writing when it comes to reviewing it? I generally try to re-read what I’ve written as I’m going along in blocks of 10-20 pages or so while it’s still fresh, basically to find typos, wrong words, missing words and to review sentence structure and punctuation. This is not always possible when a major writing flow kicks in and the words just have to keep on spilling out. Once a work is complete, I read it over again, invariably correcting and revising as I go along. Also heavily involved in the review process is my proof-reader extraordinaire and spouse, Joanne, who not only spots grammatical errors and typos but who also questions storyline structure as well in order to identify any possible plot weaknesses. I guess that I write for myself at the start. I have to be satisfied with my story before I’m willing to share it with others. Past that, I’m writing for those who enjoy reading the genres I read and write. I know that they are out there since I’m far from unique. Do you try to connect with your audience and if so how? As a currently self-published author, I must connect with my audience since nobody else is going to do it for me. The main communication platform I’ve used to date is Twitter where I’ve had the opportunity and pleasure of personally connecting with thousands of wonderful people. I feel that it’s important to actually converse with my audience as compared to simply being a selling/promoting machine. Is it important to you how people react to your writing? Absolutely. If it wasn’t, there would be no purpose to making my writing available to the public. One of the big thrills of writing is having others come back to tell you how much they enjoyed your work. Have you received negative criticism and if so how have you managed that? I wouldn’t go to the extent of saying negative criticism but rather, constructive criticism, some of it which I considered applicable and some of it which I considered differences of opinion in writing style. In the same way that there are successful authors whose works I don’t enjoy, I realistically expect that not everyone who has read or who will read my novels will enjoy them. To date, I’ve received many more ‘thumbs up’ than ‘thumbs down’ so I’m apparently doing something acceptable. There are so many published authors and more again trying, what has been your approach to the business? I had written my first three novels in 1995, 1996 and 1997. At the time, I did query for agent representation (back when the process was all snail mail) but lost interest as time went by with no success. A year ago, I pulled out my old manuscripts, re-read/revised them and felt that they had well withstood the test of time so I decided to self-publish them, more for the kick of finally seeing the books in print than for anything else. The review of the three manuscripts also brought my characters back to life and led me to write a fourth novel in the series. Since my books were now available for the public to purchase, I started looking into ways to self-promote them. This has led to modest sales and, more importantly, an eventual offer of agency representation. The bottom line is, you have to believe in yourself as a writer and recognize that if you don’t push your work, nobody else will. That’s what I’ve been doing. Do you feel that there are support mechanisms in place for a new writer? There are a lot of blogs, forums and other sites out there where writers can exchange ideas with and obtain ‘support’ from other writers. There are also many services available (for a fee) to help writers with their editing, presentation, marketing, etc. As mentioned previously, however, if one wants to try to make it as a writer, one must be ready to put in countless hours without any guarantee of success whatsoever. What is your opinion of the printed product against the electronic medium? The printed product remains the commodity item that you can walk into a store and physically see, hold and buy so I don’t foresee paper books being rendered obsolete in the near future. On the flip-side, the e-books which are increasingly available offer the opportunity to obtain instant entertainment from the comfort of your home with a few clicks of the mouse (and your credit card info). With more and more books being made available in electronic format (and sometimes not even available in printed form), this is a medium that is not to be neglected. We have two e-readers in our household now in order to keep up with the times. What I do find a little frustrating with e-books however is that the cost of such a book by a well known author is often equivalent to that of a print copy which is ridiculous considering the production, material and handling cost savings for the publishers and distributors. Do you see this as a business? If selling books is one of the objectives of writing, writing is definitely a business. The sharing of earnings between the actual creator of a work and other parties involved may often be improperly skewed but it is a business.